Imagine the ground breaking under your feet as the screeching sounds of clashing metal from society’s collapse slam into the pavement, leaving desperation and anger in its wake. That is how this album sounds. 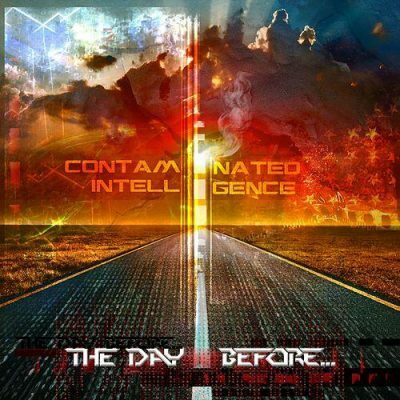 Contaminated Intelligence’s The Day Before has the traditional, harsh, industrial, guttural punch combined with eerie, carefully crafted synth riffs. Like with most industrial albums, I expect depth, experimental electronic soundscapes and heart-pounding drums. This album has all of these and manages to combine them so well that all I have to do is close my eyes to see the post-apocalyptic world with The Day Before as my soundscape. The intro, the title track, is a perfect way to begin this album. You can visually see a character stumbling down a broken path as the thudding drums echo from behind. The hazy, off-kilter synth echoes of a desperate, unknown situation. The track “Status Control” is a disturbingly angry track that uses scratchy synth elements with dark melodies that unravel into a tale of strife and sorrow. “Hush Hush” is sinister, with a resonating sample making a very valid point. Is there something to hide? This melodic track has the elements of anarchy and frustration built into it perfectly. Do we keep it hush-hush or do we scream it out loud? This track did both.